DALLAS – June 11, 2010 – Known internationally for its Latin brand focus, Pizza Patrón announced today that it is launching ¡Fútbol-Gana!, its World Cup online sweepstakes. Pizza Patrón fans have a chance to win one of four 50-inch home theater systems and many other great prizes. The promotion, open to legal U.S. residents of CA, NV, AZ, CO, TX, GA and FL, age 18 or older, began on May 17th and runs through July 9th. During that time, pizza lovers and World Cup fans alike can log on to pizzapatron.com and enter once a day for their chance to win one of four grand prize packages that include a 50″ flat screen TV, a satellite TV subscription plus a surround sound system.Twenty runner-ups will also receive a $50 gift card for WorldSoccerShop.com to buy their favorite soccer gear or team jerseys. This Saturday, the U.S. will play England in the opening round of the World cupin a rematch of the “Miracle on Grass” from the 1950 World Cup, the last time these two teams met. The game is poised to attract more North American viewers than any soccer game in history. 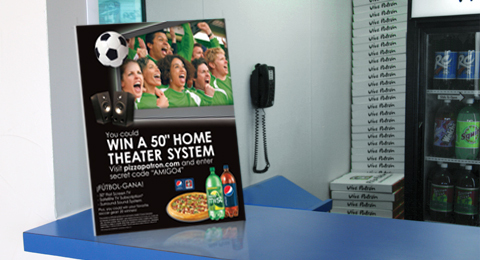 In preparation for the games, Pizza Patrón began distributing free game schedule posters on May 17th that contained valuable coupons and a secret code needed to enter the online sweepstakes at www.pizzapatron.com. The¡Fútbol-Gana! secret code is also available for participants on the company’s Facebook® and Twitter® sites, or a game card can be obtained at any Pizza Patrón location in the U.S.